Ranworth Staithe is located on Malthouse Broad which is connected to the River Bure by a dyke, around 30 minutes downstream from the village of Horning. The dyke leads you out onto Malthouse Broad, where at the far end the staithe is to be found. This is a very busy spot and mooring can sometimes involve a short wait until someone moves on. The best advice is to time your arrival between 10 and 11am if you want to stay over lunch or between 2 and 3pm if you intend staying the night. This way you are arriving at a time when other boaters have finished their stay and are moving on thus freeing up mooring space.You will need to moor stern on to the quay which can be daunting but with so many other boaters around, you are sure to be offered assistance to get your craft into any tight spots. There is room for around twenty cruisers at the moorings, which are free of charge for up to 24 hours. 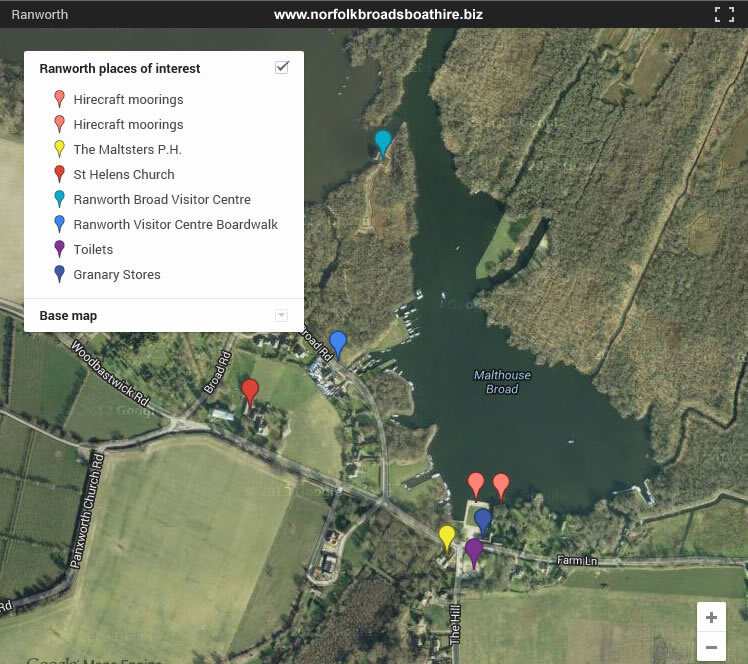 Local Attractions: Adjacent to Malthouse Broad is Ranworth Broad an area to which hire-craft are prohibited. The Broad is owned and managed by the Norfolk Wildlife Trust. As it is relatively untouched, there is wildfowl in abundance. You may also see kingfishers, cormorants and marsh harriers. The swallowtail butterfly are also present. The best way to see over Ranworth Broad is to visit the floating Broads Wildlife Centre. This educational centre is reached by a boardwalk which begins to the left of the staithe moorings. Also worth a visit is St Helens Church with it's 100 foot tower. The church dates back to the 14th century and houses a beautiful painted medieval screen. It is said to be the best preserved of it's type in the country. The Antiphoner, an illuminated service book dating back to the 15th century is also on display. Most people will want to climb the tower for the unrivalled views over the Broads that it offers. The 89 steps and two iron ladders you need to climb to reach the top are well worth the effort. Eating and Drinking: The Maltsters Public House is a short walk from the staithe. It has an extensive menu for lunches and evening meals. The Granary Stores houses a coffee shop offering drinks, sandwiches and cakes. Other Services: The Granary Stores offers provisions and an extensive selection of gifts. There is a Broads Information Centre on the staithe and toilets are available at the top of the car park. TIP: The climb up to the top of St Helen's bell tower is particularly rewarding as once at the top, the views of the surrounding countryside are spectacular.